The priests of such a god will have aromatic pomanders and probably use spells to induce "black bile" and loathesome growths on and in their victims. OK, that's pretty much the creepiest thing ever. I see cultists wearing these long billed masks during secret rituals. Perhaps a hidden disciple spreading the plague by infecting the town's well. Or the opposite: the temple as a hospice for plague victims--the priests the only ones willing to minister to them in their final days. Of course, the source of the image is alarming enough, but the long beak also reminds me of Baxbaxwalanuksiwe (which, with the paralysis and smoke, fits a pretty nasty disease profile, now I come to think of it). he's a plague doctor, his weird costume a kind of armour against the disease, minimising contact with the sufferers he treats, and especially filtering the air he breathes through a "posey" or potpourri of sweet-smelling herbs, held in the long beak-mask. 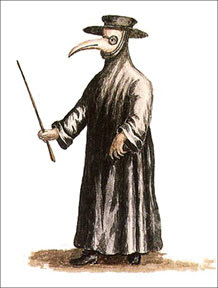 That one's 18th century Italian, but 15th century German plague doctors looked much the same. For whatever reason they were always kind of bird-like. ...I didn't mean anything more specific than that, BTW. This image, I think, is of the generic figure of the plague doctor, which became a popular carnival character in the 17th and 18th centuries (rather than a specific person) (any Poe fans here?). I just typed "plague doctor" into Google and got this image. I'm not sure its specific origin, but it's a good representation of how such people dressed and I find it beautifully creepy. For whatever reason they were always kind of bird-like. I think that's primarily a function of the belief that the long "nose" would help keep the miasma they thought caused the plague away from the doctor's nose and mouth. Masque of the Red Death is a terrific story. Somehow I can't see any of my friends dressing up in Hazmat suits, or as the spirit of Anthrax or Terrorism this Halloween. On Masque, I've long wanted to make something based on the mood/colour apartments of that story, something like Bluebeard's Castle: the house as a map of the mind. Can you think of any dungeons that play this up, revealing aspects of the boss? It seems like such a big trope in literature, but maybe it's not very old school/sandbox. Can you think of any dungeons that play this up, revealing aspects of the boss? If by "boss," you mean the main villain of a scenario, I can't think of any offhand, but I'll give it some thought and see if anything occurs to me.